The Business Register and Employment Survey (BRES) is a rich dataset from which small area analyses can be derived at various levels.  The survey collects employment information from businesses across the whole of the UK economy for each site that they operate. Employment is the number of people in employment. It consists of people aged 16 and over who did paid work (as an employee or self-employed working proprietors). The BRES figure for ‘total employment’ is often used to show the number of jobs in an area. An employee is anyone aged 16 years or over that an organisation directly pays from its payroll, in return for carrying out a full/part-time job or being on a training scheme. (Excludes: voluntary workers, self-employed, working owners who are not paid via PAYE). ‘Total employment’ (jobs) in Somerset increased by 1.3% between 2014 and 2015, compared to an increase of 2.2% at national level. The majority of the County’s jobs are located in South Somerset (66,700), whilst only 5.5% are to be found in West Somerset (12,400). 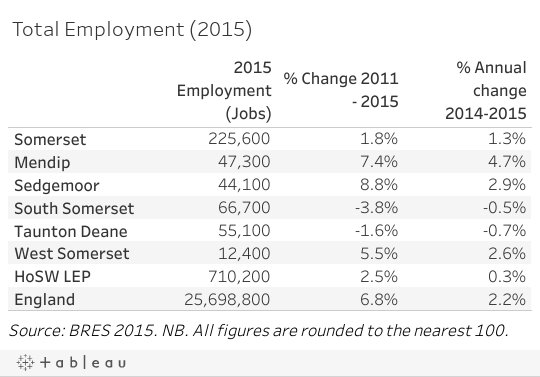 Somerset’s largest sector in employment terms is health (15%), followed by manufacturing (13%). The smallest sectors are agriculture, forestry & fishing (0.4%), and finance & insurance (1.2%). The Transport& Storage sector had the largest annual increase between 2014 and 2015 (36.3%). The Wholesale sector had the largest fall with 14% over the same period. Somerset has a higher proportion of part-time workers than the national level (36% compared to 31%)’ Levels of part-time working have remained largely consistent since 2010. 80.5% of Somerset’s residents aged 16-64 are economically active, compared to 77.7% nationally. All areas within the County have seen a decrease in economic activity over the last year. 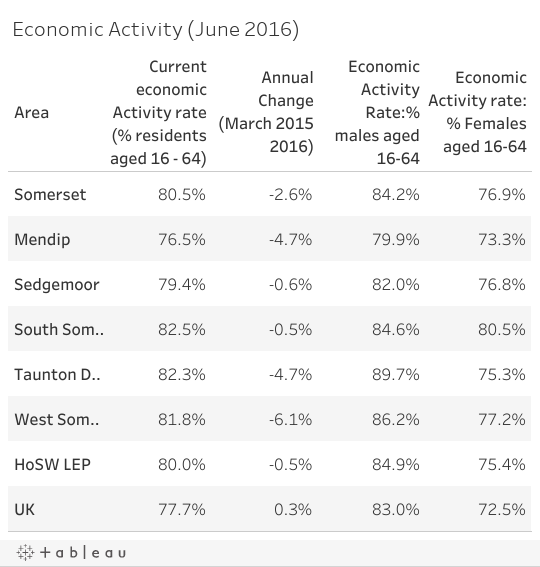 Males have a consistently higher economic activity rate than females across Somerset, the LEP and the UK. 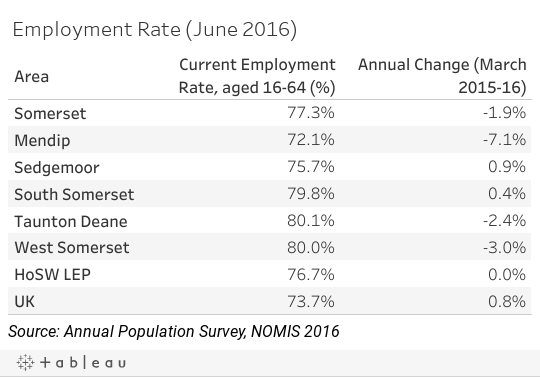 Somerset’s employment rate is higher than the national level (77.3% compared to 73.7%). Taunton Deane and West Somerset have the highest employment rate of all the districts (80.1% and 80% respectively). Mendip saw the greatest decline over the last year (7.1%).